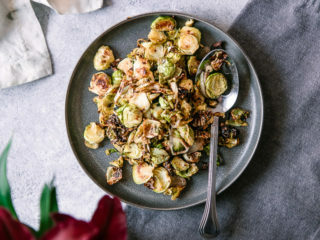 Maple Mustard Brussels Sprouts, a simple roasted brussels sprouts recipe featuring shallots, maple syrup, stone ground mustard. Delicious as a vegan side dish, or add sliced pancetta for extra flavor. A great make ahead dish for the holidays! Are you a brussels sprouts lover? 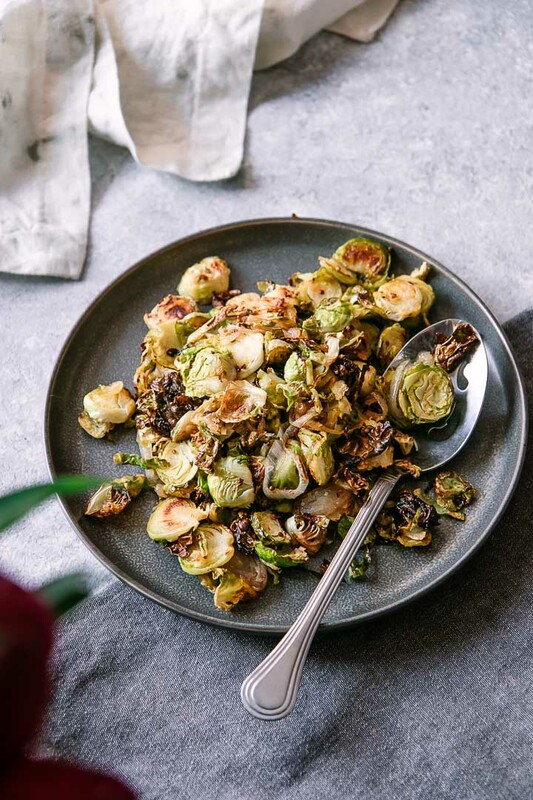 You could say that we are officially addicted, seeing as brussels sprouts are a food that makes an appearance on our table at least once a week all fall and winter long. From side dishes to salads to toppings for pizza (yes, brussels sprouts pizzas are a thing), brussels are one of my favorite fall vegetables to whip up on both a busy weeknights AND as a Thanksgiving side dish. This Maple Mustard Brussels Sprouts with Shallots recipe is my go-to easy side dish because it’s as simple as it gets, without sacrificing flavor. With only five only ingredients and under 30 minutes from start to finish (and gluten-free and vegan optional), this fall-flavored brussels recipe will be your new cozy night favorite. Ready to learn how to make this simple sprouts side dish? Let’s do it! First, cut your brussels sprouts (the most time-consuming party of the recipe). You can cut them into halves or, if you like crispier sprouts, cut each sprout into thin slices so they cook faster and brown easily. Toss the sprouts with thinly sliced shallots, olive oil, maple syrup, mustard (stone ground or dijon will do) salt, and pepper until well combined. Then spread sprout and shallot mixture on a sheet pan and roast at 400 degrees for about 25 minutes, stirring occasionally to brown all sides. That’s it! A super simple brussels sprouts recipe that is perfect for fall. Eat as a side dish or even as your main, or use the mixture on top of a homemade pizza or salad. You can’t go wrong with this easy sprouts recipe! Responsible ingredients: I try to source local and organic ingredients when I can, and for this recipe I chose responsibly-sourced quality maple syrup. I also like to use glass food storage containers instead of plastic to safely store leftover vegetables. Craving more simple roasted vegetable recipes? Check out our Kimchi Glazed Brussels Sprouts and Maple Brown Sugar Roasted Acorn Squash recipes, both simple side dishes using fall vegetables. 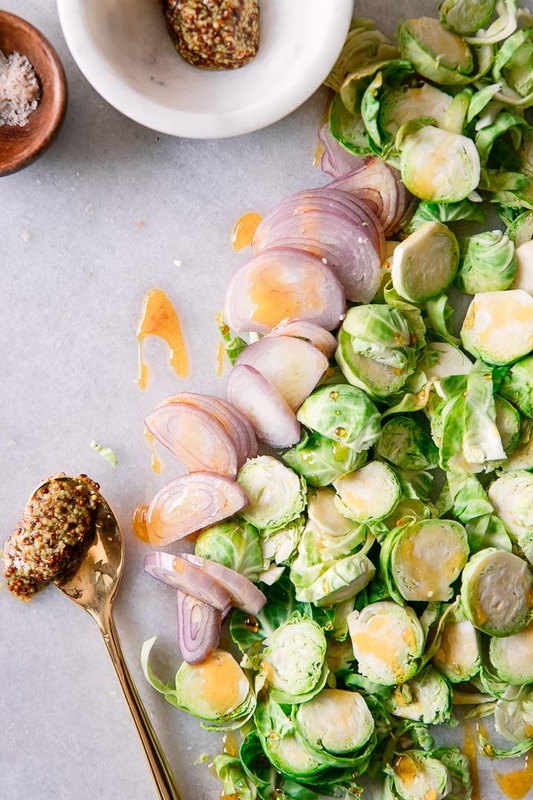 Did you make this Maple Mustard Brussels Sprouts recipe? Leave a comment below and rate the recipe to let us know how it turned out. Save this recipe for later by pinning to your favorite fall Pinterest board and make sure to tag me on Fork in the Road’s Instagram to show me your salad creations! 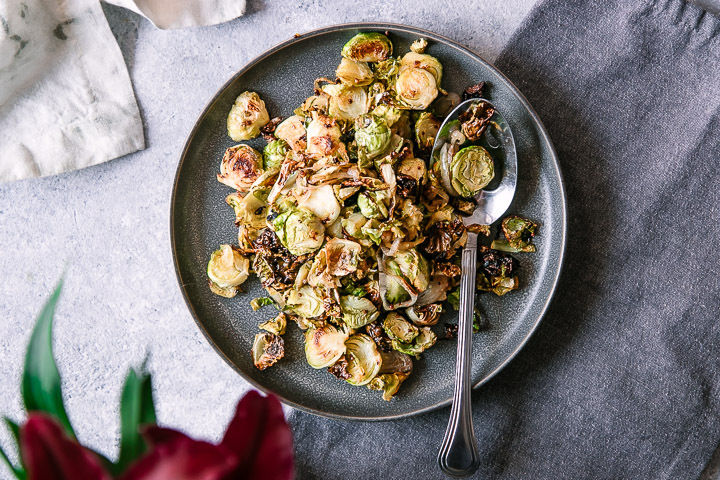 A simple roasted brussels sprouts recipe featuring shallots, maple syrup, stone ground mustard that is gluten-free and vegan. A great make ahead dish for the holidays! Combine brussels sprouts, sliced shallot, olive oil, maple syrup, mustard, and salt and pepper in large bowl and mix well. If using, dice raw pancetta and mix with vegetables. Transfer to oiled cookie sheet and bake until golden brown, about 25-35 minutes depending on your oven. Stir periodically to ensure sprouts brown on all sides, then serve immediately or let cool and store in refrigerator to be eaten later. Notes: My trick for perfectly brown (and not burned) brussels is to leave them untouched for first 10 minutes, then flip every 5-7 minutes after to prevent burning and let them crispy on all sides. Leftovers & Storage: There’s rarely leftovers, but store in an airtight container for up to four days in the refrigerator and reheat in a pan or microwave. Do not freeze, frozen and thawed brussels will not have the same texture and will get mushy. Nutrition: Nutrition information is for brussels sprouts without optional pancetta. 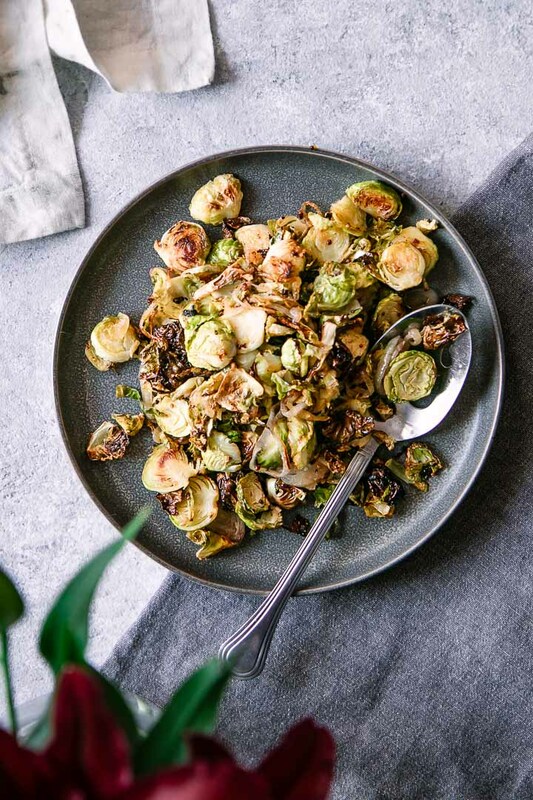 This simple brussels sprouts side dish is a good source of fiber and is high in vitamin C, which being low in sodium and high in healthy fats…and flavor! What about the Panetta? When do you add the Pancetta? I mean, do you sautée the pancetta first to start it rendering or…? Just mix it in with the spouts and let it render in the oven? Hi there! I’ve updated the recipe instructions to include the addition of pancetta, thanks for calling that out. I dice the pancetta while it’s raw and mix with the vegetables before transferring to the sheetpan for baking. The baking time cooks the pancetta and releases it’s (very delicious) juices onto the vegetables while they’re braising. I think cooking it before adding to veggies wouldn’t create the same flavor. However, the vegetables are excellent without the pancetta as well. Let me know if you make them and how they turn out! FABULOSO – I hated brussel sprouts as a child – you know the kind overboiled and nasty – had this receipe been around 60 years ago in the culinary dark ages in the 50’s what a sensation my mom would have made!! Thanks for this receipe. Jason – I hated them too. In my opinion, boiling is not the way to go with brussels. Their real flavor comes out when roasted and the maple and mustard mix in this recipe lends a bold flavor that I love. Please let me know how they turn out! We fry brussels sprouts with hog jowl! Wash and cut in half. Fry the jowl first then add the brussels making sure they are well coated in the fat! Turn continually until they are nice and brown! The flavor is incredible! You can do the same thing in the microwave! Put hog jowl in a microwaveable bowl and cook about 2 minutes until you have grease. Put your washed and halved sprouts in and stir around then microwave another 4-5 minutes! Won’t have the brown from the frying pan, but will be cook and have the wonderful flavor! I have never made them in a frying pan, I’ll have to try! I’m in love with my cast iron skillet and I can see how they would brown nicely in there. And yes, any type of animal fat takes brussels next level. I always hated them when I was younger but changed my tune when I had them cooked in duck fat. I was forever reformed! I did use the Pancetta.The Pancetta got nice and crispy but the Brussels did not. I cooked them for 36 minutes at 400 degrees. I wonder if cooking them on a higher temp. would crisp them up better. At any rate they were delicious and very easy to make. Will make again. That’s great! Yes, I think cooking them longer or at a higher temperature will help them crisp a bit. Every oven is different so cooking time may vary. Also cutting the sprouts into small pieces or even sliced (Trader Joe’s sells bagged sliced Brussels) will help as well. Thanks for leaving your comment!